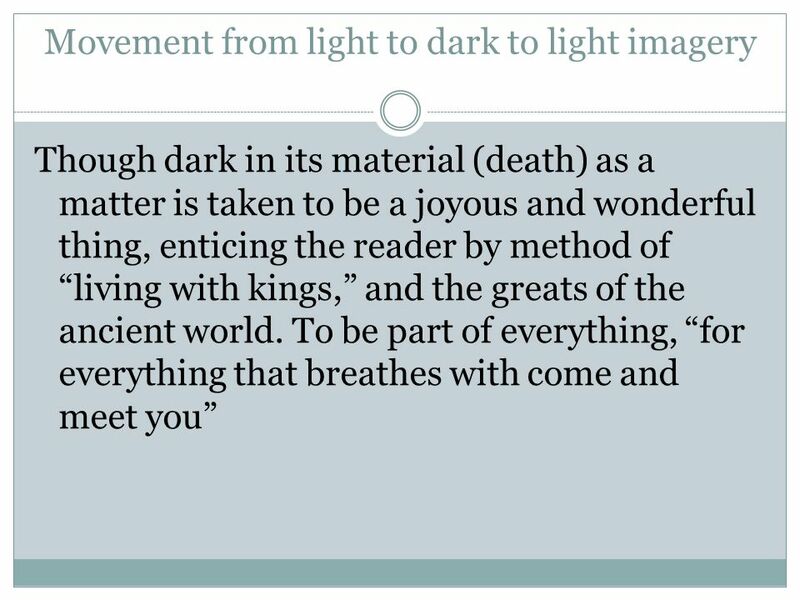 AMERICAN ROMANTIC POETRY Thanatopsis “Meditation On Death” By : Hannah Watson and Erikk Shupp. 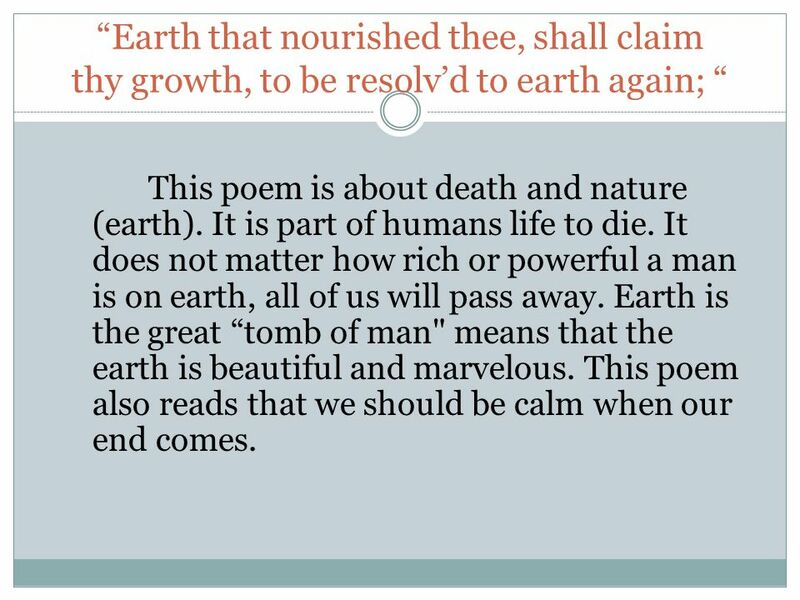 3 “Earth that nourished thee, shall claim thy growth, to be resolv’d to earth again; “ This poem is about death and nature (earth). It is part of humans life to die. It does not matter how rich or powerful a man is on earth, all of us will pass away. Earth is the great “tomb of man" means that the earth is beautiful and marvelous. 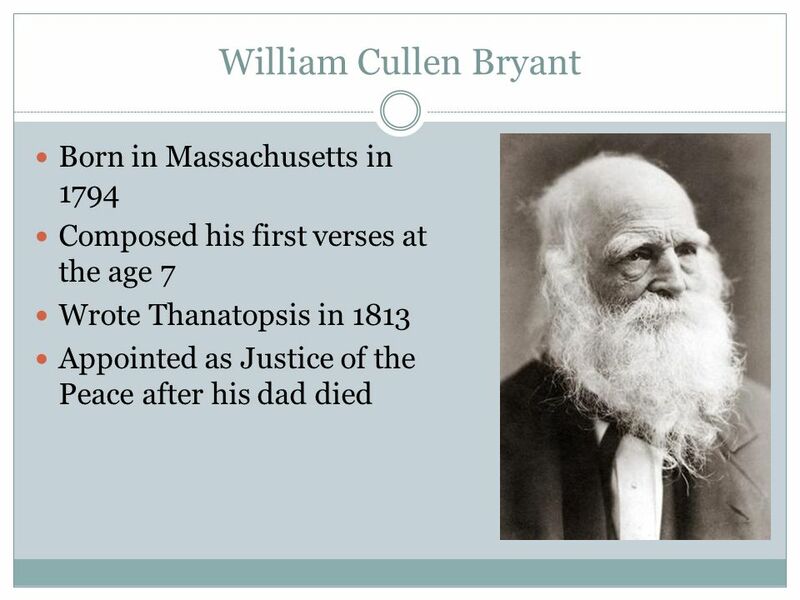 This poem also reads that we should be calm when our end comes. 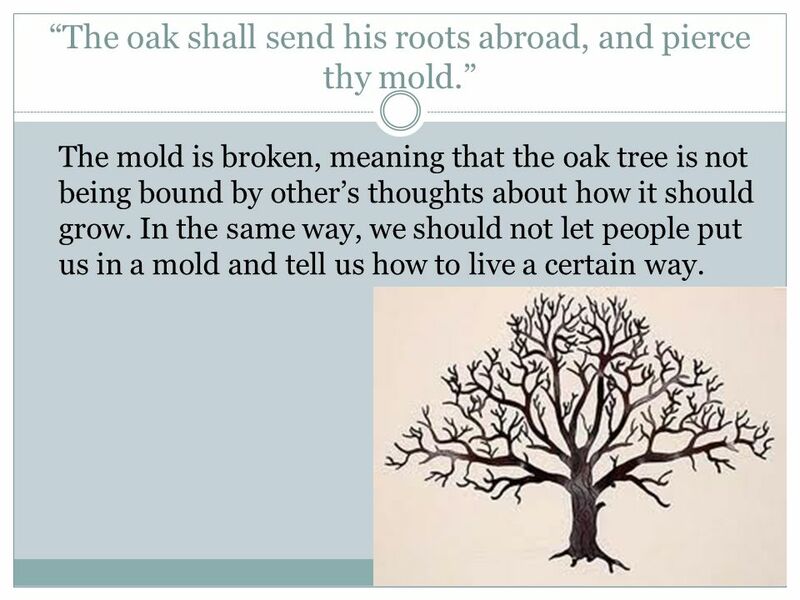 5 “The oak shall send his roots abroad, and pierce thy mold.” The mold is broken, meaning that the oak tree is not being bound by other’s thoughts about how it should grow. In the same way, we should not let people put us in a mold and tell us how to live a certain way. 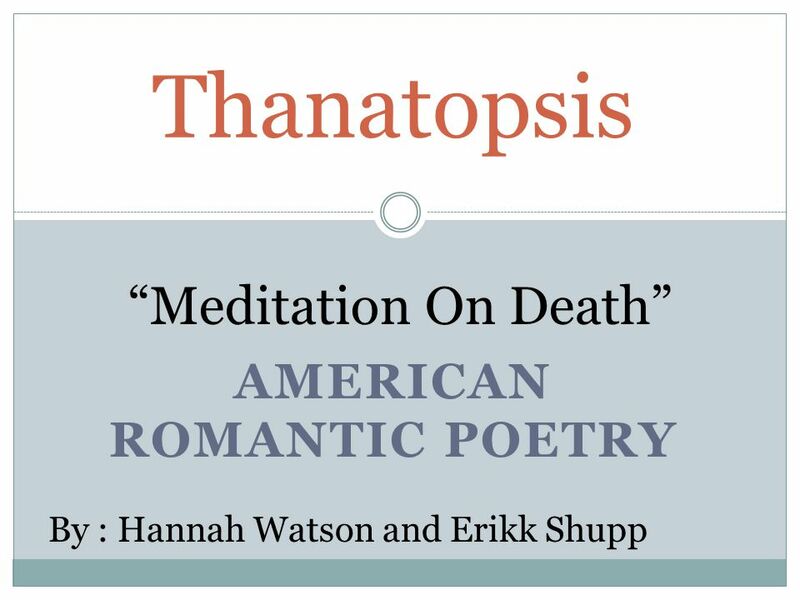 Download ppt "AMERICAN ROMANTIC POETRY Thanatopsis “Meditation On Death” By : Hannah Watson and Erikk Shupp." Turn Your Eyes Upon Jesus O soul, are you weary and troubled? No light in the darkness you see? Theres light for a look at the Savior And life more abundant. The race that long in darkness pined Has seen a glorious light: The people dwell in day, who dwelt In death's surrounding night. Lighting of the Advent Wreath Longing to make an offering to God in righteousness, we light this candle in anticipation of the coming of God’s messenger. Great God Medley O Lord my God When I in awesome wonder consider all The works Thy hands have made I see the stars I hear the rolling thunder Thy power. Turn Your Eyes Upon Jesus O soul are you weary and troubled? No light in the darkness you see? There’s light for a look at the Savior And life more abundant. CCLI License No O soul are you weary and troubled No light in the darkness you see There's light for a look at the Savior And life more abundant. We stand and lift up our hands, For the joy of the Lord is our strength, We bow down, and worship Him now, How great, how awesome is He And together we. Awesome is the Lord Most High Great are You, Lord, mighty in strength You are faithful, You will always be We will praise You, all of our days It's for. THE KINGDOM WITHIN Arise, shine, for your light has come, and the glory of the LORD rises upon you. See, darkness covers the earth and thick darkness is.